The 'NAKAGO-NUKI' is a tool that was designed to loosen 'difficult to remove' Shirasaya handles. Both the 'Wedge' and the 'Hammer head' are made of Philippine hardwood. 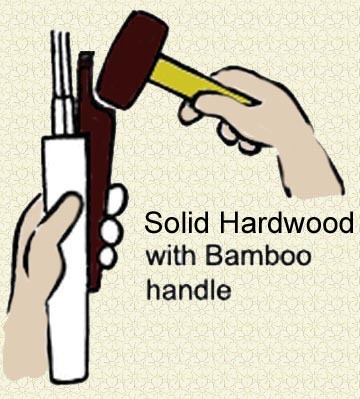 The handle is solid Bamboo. This identical 'hammer & wedge' set (made by us) is still available in Japan for approximately $65. We are the manufactures and you may order it from us at a 'factory direct' price of only $35.